Now that you have basic read/write and read-only access to your project, you may want to set up a simple web-based visualizer. Git comes with a CGI script called GitWeb that is commonly used for this. 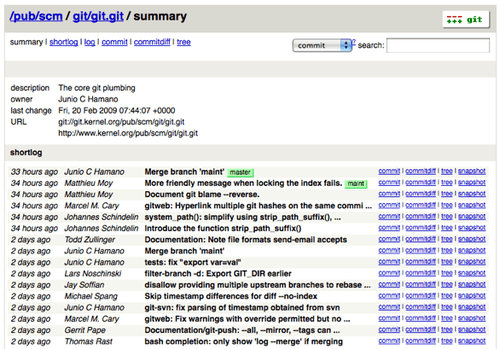 You can see GitWeb in use at sites like http://git.kernel.org (see Figure 4-1). Figure 4-1. The GitWeb web-based user interface. Again, GitWeb can be served with any CGI capable web server; if you prefer to use something else, it shouldn’t be difficult to set up. At this point, you should be able to visit http://gitserver/ to view your repositories online, and you can use http://git.gitserver to clone and fetch your repositories over HTTP.